Last week I didnt make the cutoff to play along with the Jingles Belles blog but I made sure to find some time this week. The challenge this time is to use any type of holiday animal in your design. I am sure everyone who truly knows me is expecting to see a moose card, and I may still try and get one done, but I actually went with a reindeer this time. I just got a Cricut and one of the cartridges I bought, Winter Woodland, had some reindeer images that I wanted to give a try, so this is what I came up with! 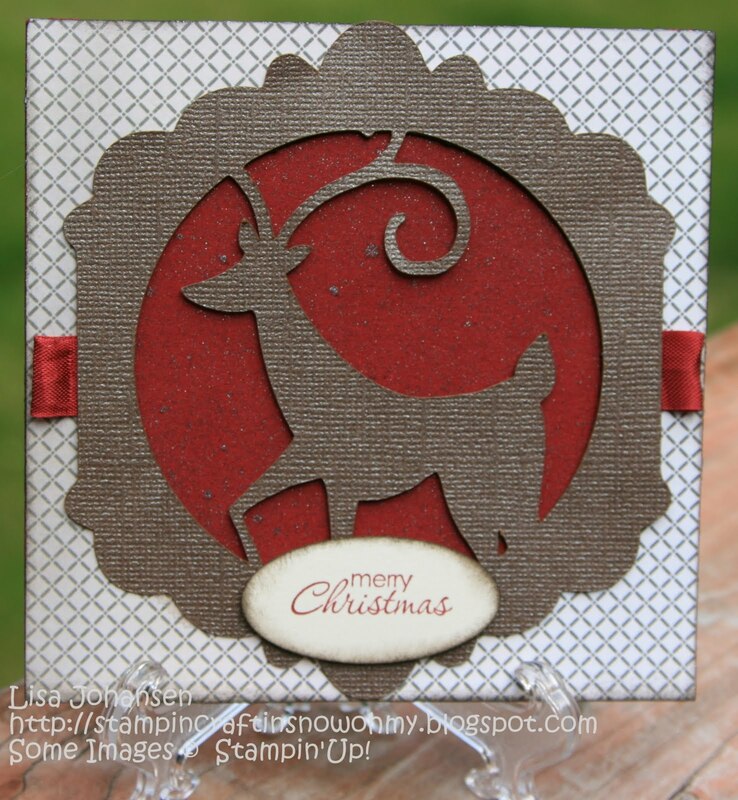 Love that cool reindeer die cut ... I have got to figure out how to get my Silhouette to cut ... so many possibilities ... so glad you joined us at jingle belles. well, i'd definitely ♥LOVE♥ to see a "moose card" at some point... but there's no way i'd trade away this amazingly handsome reindeer!!! i love the way he's cut out in the "window" with the bold contrasting color behind him, and how you've finished the card with such simple perfection! fabulous! Lisa, that is a beautiful reindeer cut! I love the cricut reindeer. The red popping out from behind adds such a nice layer. Beautiful. Super cute!! I can make Christmas and winter cards all year! Lisa - you neeeeed to do a moose card - would so love to see it. I have had many a heated discussion with people over here in Germany about the difference between a moose and an elk (they generally use the same word for both here - Elch) and I have to say that I have become a bit fixated with moose! I got to see a couple when we travelled through the Yukon which was a bit of a highlight for me (European big cities don't generally feature many moose - or elks for that matter!!). But anyway, this card is great - the cricut shape works so well and you have made such a lovely card. hope you are on the mend and feeling better again. Go on, show us the moose!! !